Digital commerce will never realise its full potential by only catering to explicit intent. Marketers must remember that shopping isn’t just about ticking items off a list. It’s also about inspiration, and that’s something digital commerce just isn’t great at – yet. 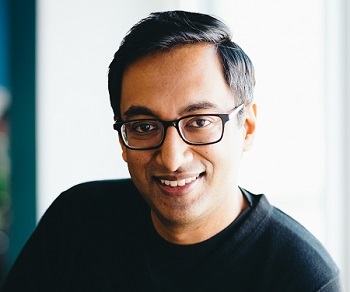 Apu Gupta, CEO of Curalate examines how brands can use visual content to nurture online discovery. Two or three times a week, late at night before I call it a day, I pick up my phone and visit Wired.com. Wired has a section called Gear that features product reviews – I like gadgets and being up on what’s new. I’m not intending to make a purchase, but I know in the back of my mind if I encounter something that’s really cool, I might buy it. Often I don’t find anything, but occasionally I do. These are very non-specific shopping experiences where I’m feeling inspired and discovering products I never knew existed. At other times I shop with intent. If I need a travel adaptor or six rolls of packing tape right now I’ll head straight to the search box of my favoured online retailer or run a price comparison search on Google. Inspiration and intent are polar opposites. It’s your Saturday afternoon amble along the high street versus online grocery shopping. The difference between pleasure and purpose. Even two decades in, ecommerce continues to best serve those who know what they’re looking for. But how do we help the customer who is looking for inspiration? Offline, retailers work tirelessly to create environments in which people can stumble across things they never knew they needed in their lives. But online, the pleasure-seeking shopper is often left with a search box that doesn’t understand their needs or forced to browse page after page of products until inspiration finally gives way to frustration. Consumers don’t just strictly shop for pleasure or with purpose. Instead, we frequently shift between purpose-driven and pleasure-seeking behaviours based on a range of factors, such as our mood. So, the same consumer who buys with intent one day may be a lost opportunity the next, when they’re just seeking some retail therapy. So how can brands and retailers make inspiration more central to the digital commerce experience? The customer journey – the path a person takes to purchasing a product – may be growing increasingly complex, but invariably the path starts with discovery. As people move from discovery to purchase, their opinions become solidified and their intent strengthened. In these later stages, marketers compete for a person’s transaction. But in the earlier stages, marketers get to compete for a person’s consideration set – for the opportunity to become a product that someone is not only aware of but also interested in. This is where social comes in. In those moments on the way to work when people pick up their phones and start scrolling through feeds on Pinterest and Instagram, they’re not looking to buy. They’re looking for inspiration. And brands do a wonderful job fuelling inspiration with content that stops thumbs. While this may sometimes result in an immediate sale, more often than not, social is introducing people to their next great find. In a survey of 1,000 consumers we commissioned, we found that only 4% of people immediately purchased something they saw on social. In contrast, 67% of people reported buying something they encountered – just not right away. All this is to say that social can indeed inspire the pleasure-seeking buyer, but taking a last-click approach to measuring social will almost always sell social short. Once you’ve recognised that social can shape a person’s consideration set, it’s important to think about how to go beyond the products featured in a post. Online, it’s easy to amass product catalogues with vast amounts of choice. But on channels like Instagram, etiquette dictates that you take a measured approach to how much content you post daily. The result? Your posts are going to feature only a tiny sliver of all the things you have on offer. That’s a shame. Because when people are simply seeking inspiration they’re not blinded by intent. Instead, they’re far more receptive to new ideas, new brands, and new products. That’s why it’s important to think of your social content as the new window display. In physical stores, window displays are rarely about getting you to buy what’s in the window. They’re about getting you into the store. Social content can serve as the same jumping off point when paired with product recommendations. Product recommendations engines are nothing new. Many modern ecommerce sites utilise them on product detail pages – portions of the site that are fairly far down the purchase path. But making programmatic product recommendations early in the journey, when people are still adding to their consideration set, isn’t all that common. So we tried it. We created a mobile-first experience that a consumer arrived at after leaving a social post. The experience used the products featured in a given social post as the inputs to a recommendations engine. The results? 80% of people who clicked from the experience to a retailer’s website did so on a product that was recommended. And, on average, for every product a marketer featured in their social post, this experience caused people to explore an additional six – enabling a small number of social posts to expose consumers to a much broader set of products. Ultimately, this suggests that the products retailers are featuring in their posts are great at stopping thumbs while recommendations, presented early in the customer journey, can be great at recreating the ‘store’. Until now, we’ve been discussing the inspirational customer journey that originates on social channels. But what about the person who bypasses social and comes directly to your site? That’s not a small number of visitors. And, like all consumers, sometimes these people just want you to inspire them. This is where reusing social content can be powerful. 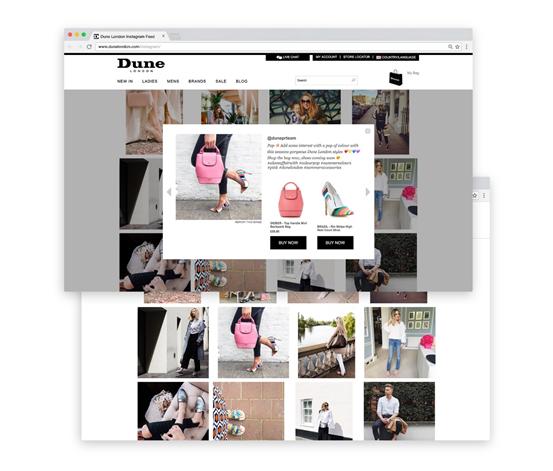 Social content – whether created by you, influencers, store associates, vendors, or customers – can be easily leveraged to create beautiful, shoppable galleries that can create a social-like discovery experience right on your website. This is an incredibly powerful way to increase time on site, drive product discovery, and increase order values. Online, we have over-indexed on intent. By ignoring the fact that consumers seamlessly and unpredictably shift between intent and inspiration, we risk alienating the same consumer who comes to us when they need something specific. This is a solvable problem. Thinking of social not just as an engagement channel but also as a discovery channel reframes how you measure and value your efforts there. And thinking of social as a compelling source of content enables you to create rich experiences on your website that capture those moments when people just want you to introduce them to something great.